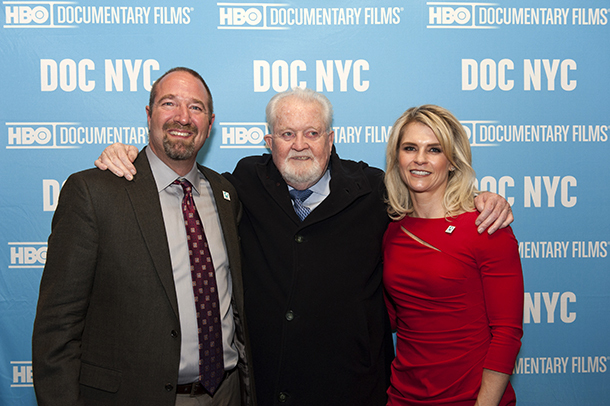 I was privileged to attend the world premiere of Huntwatch at DOC NYC in New York this past weekend. IFAW’s 46-year long campaign to end the commercial seal hunt is a story of determination, persistence, conflict, and adaptability. A tale of victories and setbacks, the film shows how the campaign’s tactics have been forced to change with the times. Having worked on IFAW’s seal campaign for 18 years, it was fascinating to see the grainy footage from the campaign’s early days, and re-live some of the more tense moments on the ice in more recent years. While it was wonderful to be able to share IFAW’s history with an audience, what I found most interesting was being able to speak with the audience afterwards and hearing their perspectives on the film. Too often in this line of work, we can forget about inspiration. We focus on objectives, outcomes, milestones, and indicators. We value the things we can measure, and regularly evaluate our activities to ensure that we are achieving the best impact for animals with our donors’ dollar. We are motivated: we have a goal, and a plan to achieve it. We are disciplined, and work constantly and relentlessly towards our target. But motivation and inspiration are different things. Inspiration is when an idea takes hold of you and carries you where you are intended to go. And when it came to ending the slaughter of baby seals, Brian Davies was inspired. Whether learning to fly a helicopter to document the bloodshed on the ice, ambushing and disrupting a Canadian government press conference in Europe, or subtly giving the middle finger to a journalist who refused to research the facts, Brian had the courage of his convictions and acted on whatever moved him. He didn’t worry about what other people thought, or how much money it would cost; he did what he felt was needed to capture the world’s attention on the suffering of the baby seals. Brian Davies was inspired to make a difference, and in turn has inspired millions – including me. It is my hope that Huntwatch will inspire all who view it. Whether it inspires you to protect helpless animals, to stop global warming, or to fight social injustices, it doesn’t matter. Whatever your personal passion might be to make the world a better place, Huntwatch will hopefully inspire you to act on it, and in turn inspire others. Public screenings of Huntwatch are being planned in Canada and around the world in March 2016. Please keep an eye on the ifaw.org blogs and follow us on Facebook, Twitter, and Instagram to be kept informed of upcoming dates and locations!